Ok so I've been doing quite few lazy posts on Foursquare. Sebenarnya memang nak tolong kawan-kawan lain get the badges I have. I have so many requests to help out and I do want to help you guys, but while I have no qualms about jumpers (read previous entries on Foursquare to understand what jumpers are), I am not going to teach you everything. I help only in letting you know HOW to get the badges. In other words, you're already there in terms of knowing how to unlock the badges. How you actually do it - you have to make a little bit of effortlah. Takkan nak suap segalanya. Kang nanti the purists (and jealous) kata aku ajar korang menipu lak. Kan? Anyway, hari ni nak lari topik sikit. 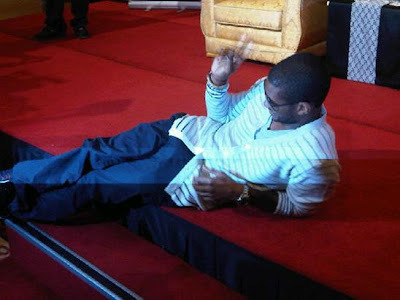 Tadi gi jumpa Usher. Hado? Mr Usher Raymond came all the way here for 15 minutes. That's the 'press conference' Matilah ko! Bodoh ke apa management sampai kekwat camtuh. Ke keja promoter as usual yang takleh pakai. Everyone 'loves' Galaxy... those who have been to their concerts can draw their own conclusions. Anyway, if you're an Usher fan, nah amik ko! Ni pic member aku snappy. Sesuai baring kat lantai jek. Ni dari penyanyi dari tweet pon panggil KL - Kuala LAMPUR. Matilah ko! Heh! Esok keja nya pasal kena gi layan concert dia. Ok la tuh. He's got some nice tunes, tapi ada aku kisah pasal dia? Layan jerk. More interesting however, is the World Cup match that just ended. Netherlands is in the final (yawn!). Not that I like Uruguay - but I prefer if the final was just Spain and Germany. Unfortunately tomorrow they clash for the other spot in the final. I like both teams (Spain a little more, but the only team I supported for real is Mexico) so it's sad they have to showdown for the final. I will however be wearing my Spain jersey. Especially since Paul has predicted Spain will win, convincing me even more. Paul - is a German octopus for those who don't know. And yes, he picked Spain!!! Paul, apparently has been right on all the predictions for Germany so far, but when it came to the showdown with the Spaniards, he betrayed his own homeland. Heh! Matilah pasnih ko jadik la sepeket Double Decker la, Paul! And this is the raw footage from AP. I think I'm a fan of Paul. Seb baik tak dok Malaysia, kalao tak abih kena kerumun nak ramal nombor ekor. 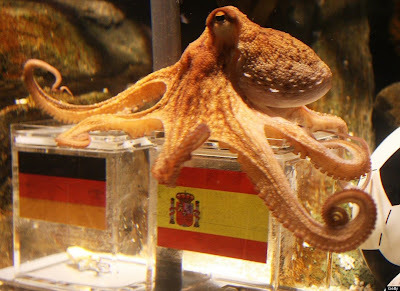 So actually pics of this came up a few days ago, but apparently it was some Spanish fans who were desperate to prove Paul - the worldwide sea-oracle would predict Spain would win. Hence these picture was circulated. Without the usual video recording of the 'fortune telling' session. 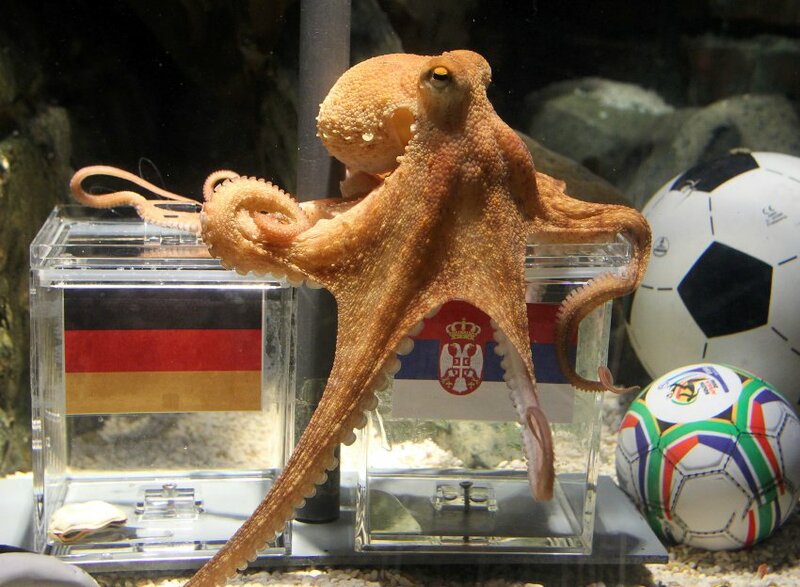 Apparently this is the original photo where Paul picked Serbia over Germany in the group rounds. Was that even an attempt to make it look like the Spanish flag? Horrific Photoshop effort! But the Oracle with tentacles has spoken and Spain it is, Paul! Anyone wanna bet on Germany? I think I'm confident in Paul enough... place your bets, people! PS - Packed day tomorrow!!! One album launch, a tea session, a concert! Argh!!! And then, have to stay awake for the match! Thursday going to be so zombiefied! At least I have a week in Bangkok waiting! Yeay! Will be watching final in Bangkok! PPS - Am so thankful that God has shown me that masih ramai sayang kat aku. Everyday is a blessing as I'm finding more and more things that make me smile. Amen!